Thor 2 = Thor Who? Bruce Banner said it best: “He really grows on ya, doesn’t he?” Indeed. I started fangirlin’ a little bit after finally watching Thor and now, after seeing the sequel on opening weekend, he’s officially my new celeb crush—but apparently I’m late to the party because #Hiddles seems to be everyone’s boyfriend fantasy. Tumblr is completely twitterpated, he’s being interviewed everywhere (well, maybe not everywhere—Ellen, stop slackin’), plus I myself can’t even make it through the day without hopelessly trolling Loki GIFs (thanks, BuzzFeed). He loves Shakespeare and tea, he’s so adorably uncomfortable when his looks are complimented, he hung out with Cookie Monster, he’s in commercials with kids, his bloopers are downright charming, he likes slumber parties, he does impressions, and have you seen him DANCE? Where was I … OK, OK, all that being said, can we just talk about The Dark World for a minute or two or twenty? 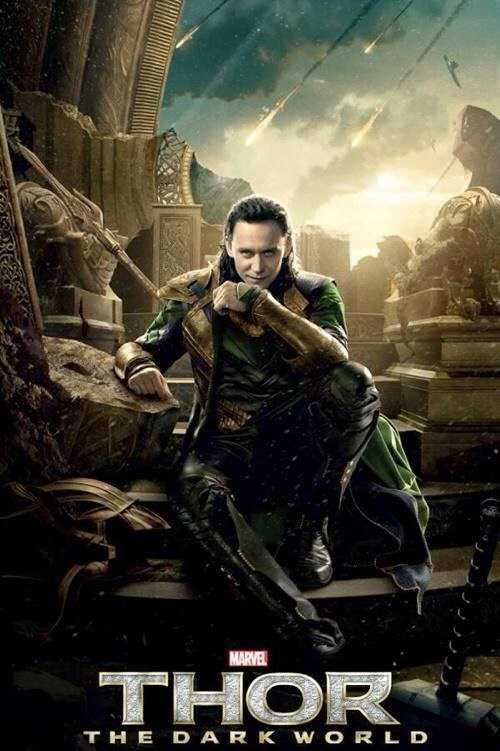 Part of why we worship Loki, I imagine, is his vulnerability. We love broken men because we fantasize about scooping them up and kissing their pain away, amiright ladies? Out of all of Marvel’s villains, Loki is the only character who was given a fully fleshed-out backstory, IMO. Discovering his true roots (in Thor) tears his sense of self-worth to shreds and he reacts violently in retaliation (in The Avengers). Sure, we get that. Naturally, that meant Tom’s performance in Thor 2 would be inevitably all the more powerful. Brought back to Asgard as a prisoner, he’s sealed up in another glass box as a dirty little family not-so-secret until, how convenient, Thor needs his help. “So I am no more than another stolen relic, locked up here until you might have use of me?” Yep. Pretty much. Yes. Well said. For me, the movie really started as soon as Loki, burdened with glorious sass, is busted out to join the task force to stop the world from ending (again). The spring in his step is contagious. With his token devilish grin securely in place, the humor that lasts the next few scenes is pure perfection. Thor and Loki are just typical brothers again, ribbing each other in delightful fashion and arguing over who gets to drive. Mischief vs. thunder! After that scene, I personally didn’t care either way if London imploded. So Thor saves the world while Natalie Portman watches a la Santana Lopez and the movie’s basically over. Thor goes to King Odin and says he doesn’t want the throne; he’ll protect Asgard when needed, but he belongs on Earth with his lady love. Odin lets him go graciously, but then—PLOT TWIST! What the actual hell is going on?! Whatever. I just hope this means that someday we get a movie all about Loki. Called “Loki.” Have every scene be Loki. And on that frighteningly teenage-fangirl obsessed note, it’s time for me to go have a Marvel marathon. Back-to-back Thor and The Avengers, then I think I’ll go see The Dark World again tomorrow. Because I can. Because Loki. Because Tom nom nom. Thor: The Dark World is in theaters now. What are you waiting for? P.S. If there are any Marvel experts willing to explain that ending to me, be my guest. Is Loki really alive? This entry was posted in Celebrities, Movies and tagged asgard, chris hemsworth, god of mischief, god of thunder, hiddlesworth, jane foster, loki, natalie portman, the avengers, the dark world, thor, thor 2, tom hiddleston. Bookmark the permalink. I don’t read the marvel comics but I did a little research on Loki … he almost never dies lol. He and Thor are in all kinds of comic book series (whether they all relate or not, I’m not sure of) so you can say that Loki does live. However, movie!marvel is taken into a different perspective with generally similar plots. Which means that the producers may want to kill Loki or exclude them altogether. If they’re smart enough, they’ll keep Loki alive for business sake. Let’s hope for the best!! Loki could practically carry the whole Marvel movie genre by himself, haha. Did you see what happened when he went to ComicCon? Insaaaanity! I was so jealous. Thanks for reading! I’m sure the Marvel studios have heard of the man who killed the goose who laid the golden egg. It’s possible they’ll kill Loki, but it seems like a bad business move. Have you heard the rumors that Loki will be back for the third Thor movie? God, I love the way you wrote this article. I do agree with you. If you are interested about him, you need to watch talk shows he joined. Just search Google. Why, thank you, haha. I just couldn’t keep my Loki/Tom gushing internalized anymore. 😉 Thanks so much for reading! And don’t worry, I did my homework in order to find all those awesome (and adorable) links. I watched him on YouTube for hours. He is certainly humble and sweet. I can’t wait to see what he does next.